I have read that blindness is one of the greatest fears of many people. Some have going blind as being worse than death. 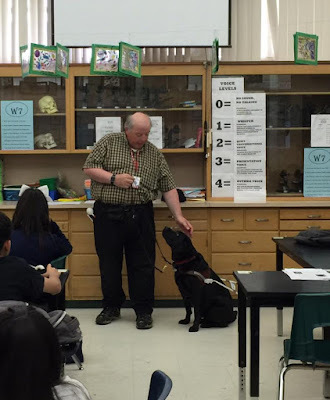 Yesterday I went to a local Middle School to talk to the students about blindness and working with a guide dog. The students had recently been studying the structures of the eye, from there many of them raised questions with their teacher about whatt happens when those structures fail and people become blind. Their teacher then came to me and asked if I would come in to talk to her students. I was very pleased to help. 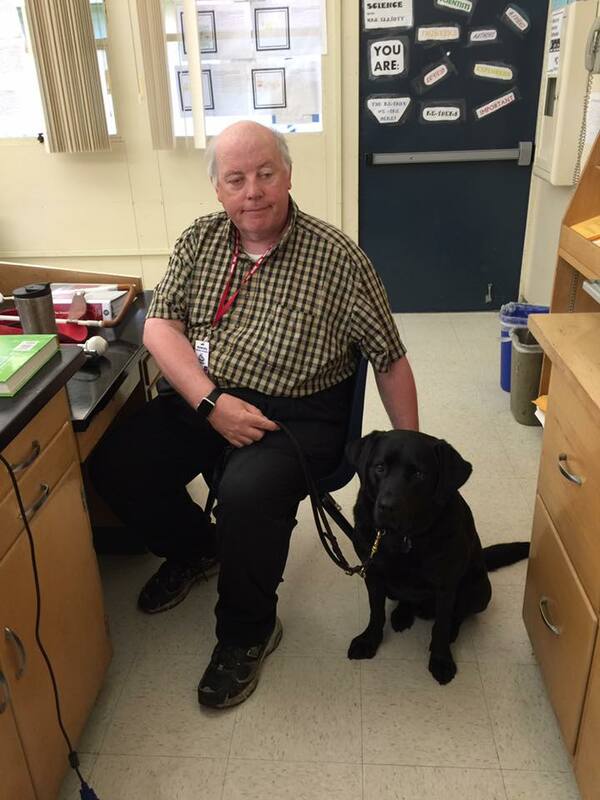 The presentation included a video about the training of guide dogs from being young puppies to being recalled to Guide Dog training school for final formal training. I then filled in about how I needed to learn the skills of being blind myself. Many of the students were surprised that not all blind people are born blind. The idea of having to go to classes was something new for them. Many of their questions were of a practical nature. "How do you get dressed?" "How do you shave in the morning?" Those sort of things. Plus questions like "Do you know Braille?" These questions were on the whole quite easy to answer. Basically working at the problem and learning solutions. Some students took a harder to answer route, "What does it feel like to be blind?" That one was tough, How does it feel to be blind? I went for the answer in terms of the transition phase from sighted. Fear, it is frightening at times. Frustration, there is a lot of frustration learning all the new skills that one needs to survive in a world of sighted people. Then to satisfaction that life is not that bad on the whole as a blind person if you learn to be creative with your problem solving and accept that there is no instant answer to all the problems of blindness. One student raised the point that he would prefer to die rather than go blind. I asked him to explain his reasons, all of them were reaal concerns, not being able to drive, not being able to look at girls, not being able to feed himself and also the fear of isolation. These are all real worries. I went through many of these same fears myself. I did make an attempt to counter some of the ideas. After all we blind are taught to navigate a plate of food, so learning to eat is a skill we have to relearn pretty quickly, but it is a skill after all. The really scary idea was his final one, isolation. For many blind people isolation is all too real the feeling of helplessness and a society which often turns a , forgive the phrase here, "ablind eye" to the blind. Now that idea of this young man was not so easy to counter. So the day went well. I spoke to about 160 students over the course of the day. 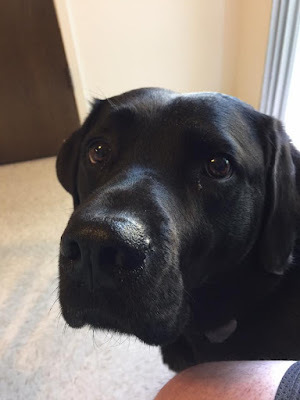 Leif, my black Labrador guide dog got lots of ear and tummy rubs and hopefully we helped to shine a light on blindness from a personal perspective rather than being an abstract idea. Thereby dismissin some myths about blind people in general.